Some airlines just offer better legroom, so keep those bookmarked. Editor's note: Brett Snyder writes a weekly CNN.com travel column. He is the founder of air travel assistance site Cranky Concierge, and he writes the consumer air travel blog The Cranky Flier. 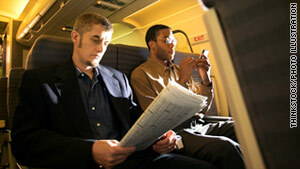 (CNN) -- If you're tall and you travel, then finding seats with the best legroom is an incredibly important exercise. Unfortunately, it's very difficult to do. It's made far more difficult since legroom is measured using an awful proxy called "seat pitch." Sometimes it makes you think you'll have more legroom than you do, while other times, it might be the opposite. Either way, there are better ways to look at this. Seat pitch is the distance between one point on a seat and that same point on the seat behind. If you start measuring at the front of the seat bottom cushion, then you would stop at the front of the cushion in the seat behind (or in front, for that matter). This may have made sense when seats all looked pretty much the same, but that's not the case now. Since "seat pitch" is the standard measure in the industry, it's really the only measurement of legroom that's made available. You can find seat pitch on airline websites or third-party sites that aggregate the data, but you won't find actual legroom information anywhere. That's a problem. In coach, many airlines have introduced what are being called "slimline" seats. Technology has enabled airlines to still meet the stringent safety requirements while having a lot less seat. These have thinner seatbacks than traditional seats, so airlines love to crow about how that means fliers will have more legroom. Take a look at American's 737 aircraft, for example. Originally, it had 132 seats in coach with 31 to 32 inches of pitch. Now, it has standardized at a flat 31 inches of pitch with 144 seats in the back. That seems like a big difference, but your knees shouldn't feel it. The new seats are thinner, so theoretically, that means your legs will have more room (or at least the same amount in this case). On top of that, these new seats don't recline backward into someone else's personal space, but rather slide forward into your own. So you control your space instead of being at the whim of a dreaded recliner in front of you. But how are you supposed to know that? The airlines really don't seem to care about pushing an accurate measurement of legroom into the public arena. So how can you know? Sadly, you really can't without doing real research, so here are some tips. • Sites like SeatGuru.com and SeatExpert.com publish seat maps for some of the most popular airlines that Americans take. If you look at the seat map the airline shows on the flight you're taking, you can match it up with the ones these sites have. • Some airlines just offer better legroom, so keep those bookmarked. No. 1 on that list is JetBlue, which has generous legroom in coach but also offers the ability to buy an extra few inches on top of that in the "Even More Legroom" section. • United offers more legroom for a fee. On United, Economy Plus can range from a few bucks to just over $100 for longer flights. This will be rolled out to the Continental fleet over the next few months as the merger completes. • Delta is rolling out a similar offering called Economy Comfort this summer. You can pay a nominal fee for extra legroom, but Delta offers this only on long-haul international flights. Its partner KLM has the same thing. • You may think of Southwest as a no-frills airline, but you'll actually get an inch or so more legroom on the airline. • Avoid ultra-low-cost airlines like Spirit and Allegiant if you need extra space. These airlines have incredibly low fares, but those come at the expense of legroom. • If you fly a lot, earn elite status on your airline of choice and you'll have access to exit rows and premium seats without charge, depending on availability, of course. If all else fails, your last stop should be the gate agent. Though most airlines reserve exit rows for their frequent fliers, if there's an empty seat there and you're at the gate, the agent should be able to seat you there. Of course, with flights incredibly full these days, that's more of a long shot. Be prepared and choose your airlines wisely. Remember to look at the seat map to see if your ideal seat is available before purchasing a ticket. If not, you might want to look at other options.